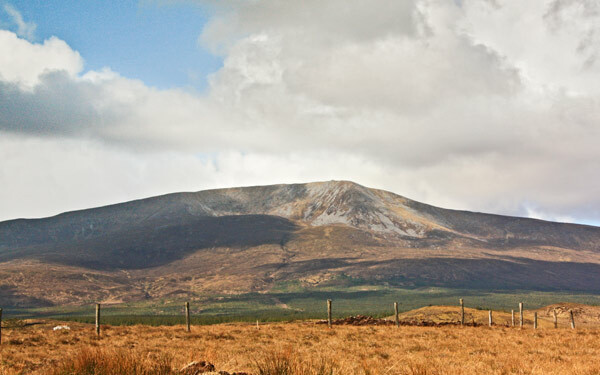 Picture from group : Slieve Carr from East showing steep quartzite scree slopes. Picture: Slieve Carr from East showing steep quartzite scree slopes. Challenging, remote, with great views. This summit may be the most remote and hard to get to of any in Ireland. It has considerable merit, having a magnificent 400m ridge on the summit, which has an enormous burial mound and great views of Achill and most of the Nephin Begs. There are at least four approaches, from the East, West, North and South. From East: Park at F 9759 1664 A outside a sometimes locked gate. Ask permission at the house at F9657 1602 B. Proceed along a forest track over a newish bridge into the forest. The track winds its way to a small lake at around F945145 C . Head SSE along a fence to open ground. It is possible but dangerous to ascend directly to the summit from where you emerge. Better to contour to around F923132 D and go up the SE ridge. Round trip will take 5 - 6 hours. From West one way is to start at F85390 15197 E where there is a footbridge. Ask permission of locals and in particular at the house that the bridge leads to and note that this is a sheep farm so dogs or large parties are most unlikely to be welcome. Walk east to the Bangor Trail and use it to get to the Tawnyanruddia spur. and then up the S ridge and spur of the summit. From North walk South along the Bangor Trail from Bangor Erris to the Tawnyanruddia spur.